The 49ers executives will be out of the office until Thursday. But, they’re still busily at work. CEO Jed York and general manager John Lynch are in Phoenix for the NFL’s annual league meetings. This is the time of year executives and coaches from all 32 teams meet and discuss potential rule changes for the upcoming season. It’s also the time executives and coaches speak to the media to share breaking news, explain roster moves and provide clues (or non-clues) about the upcoming draft. I hope Jed approves the ref in the box, and allows challenges of Pass interference. I hope he advocates for a wall of monitors on loop, so every angle can be seen many times, and a replay challenge can be decided withing 30 seconds. Glad he has confidence in JL and KS, but hope he has spent enough money to help them win. Hope Jed has improved the coaching staff so they can help lead the team to victory. Do you have a loop of monitors around your yard while you’re mowing, Seb? Lonely days. Lonely nights. Where would we be without our Sebber? Good morning Mr Sunshine, you brighten up my day. NECESSARY!!??? Is it NECESSARY to drink my own urine??? I do it because it’s sterile and I like the taste! Hi watoc6767, your link doesn’t work.. can you please correct? I keep clicking but not getting anywhere with the link. Please correct! Get that interview with Denise. 3rd degree Burns was always my target in a trade down scenario, if for some reason the Cardinals left Murray at the alter for The Bosa Constrictor. He’s been my 2nd best pass rushing DE in this class, and has the frame to put on 10 lbs. of muscle easily without missing a beat. I think this team is in a good place. We knew there would be breakdowns, and difficulty finding parts but from top to bottom this team and organization has grown together…. Here’s my trade down scenario. Actually, a few options in a trade down. Two first rd selections for our #2. 1. Ed Oliver and Brian Burns. 2. A. J. Brown and Brian Burns. 3. Drafttek’ recent trade scenario – QW and DK Metcalf (trade partner NYG’). I lean more towards AJ. than DK. Either of these options would make for a great haul. Thanks, AES. Those are some good options. If Shanny drafts a wr in the 1st round, it will be telling. He’s never drafted an offensive player outside of OT in the 1st round. He’s gonna really have to love him. I’ve been struggling with that second 1st round pick, but generally believe it should be in the secondary. FS or CB. Since FS is deeper my reasoning is we can get a Thornhill, Thompson, possibly Adderley with that #36 pick. Then I’m realistically looking at where that extra 1st round pick might be. If it’s the Raiders, A.J. Brown should be there. Byron Murphy probably won’t be, and that’s who I’d like. But if it were the Giants, then I think Metcalf is gone and for me it would come down to either Murphy or Cody Ford, who can play OG/OT…. Jawaan Taylor may also be a good alternative. He would be an upgrade at guard, and be the eventual replacement for Staley. He could be a 10 year starter for the team. Lynch should take a page or pagesout of the Bill Walsh draft book. Make calls now to find out which team that drafts lower needs and wants that guy Williams from Alabama who looks like the reincarnation of the great DE Reggie White and take thier first rounder and a second rounder also and go OL as the future of this team is a great O line and then a safer better OB and a couple developing recievers ger better and thenthe running game is better and the defence spends less time on the field and can do so much better. Lynch read the Walsh book , he only won three SBs and then had the team positioned to win another two but they only won one. Good defenses become great defenses if they only have to play 25 minutes. +1 Razor. BTW, you’re on fire lately! I wholeheartedly agree with The Draft Networks Edge prospect rankings. Of course, Nick Bosa was the unanimous #1 Edge prospect with my guys over at TDN, 3 of those guys have Brian Burns as their #2 prospect. It’s no surprise that Nick Bosa was the unanimous choice, as he is also the #1 overall prospect on almost everyone of their big boards, but I was happy to see 3 of their analysts – Joe Marino, Kyle Crabbs, and Benjamin Solak, all ranking Burns as their #2 Edge prospect. Brian Burns looks dynamic on film, and I think he’s also a very complete NFL prospect. I don’t really see any real weaknesses in his college game right now, and I think he projects very favorably to the NFL because he’s both a well rounded, and versatile edge defender. 1/ Kudos to JPN for identifying Kaep’s attorney as an unscrupulous character. He’s recently named as a (so far) uncharged co-conspirator in a money fraud scheme. Kaep’s attorney. Now I find out we’ve prepaid for Draft Week & Weekend! Cool place. Great scenery and quiet and solitude. No tv. No WiFi. No phone coverage. What ever they do on Draft Days…..I’ll be the last to know! It’s okay, for two days only you can make up your own draft and no one can tell you it’s wrong! Then you come back and realise it was even worse than you feared. Seems like Lynch has been on a subtle PR campaign to brace the fan base in the event they choose Q. Williams. Schartz O’Bettah Traedenbacher seems to be the fan favorite at pick 2. He wasn’t invited to the combine. He hasn’t had a pro day or team visit either. Yet fans are clamoring for him. They call this lying season, but for me it’s greed season. I keep thinking about a trade back to pick 4, with one of Allen, Williams or Bosa falling if a QB is taken top 2. Given the excellent defensive depth in this draft, which trade would be most appealing? Normally I’d choose A without hesitation. A is still my choice but B seems pretty good too. The talent depth is said to be very good this year, and it would be nice to recover the 2020 2nd. I still like A but I’d be fine with option B.
I’d be plenty fine with Option B. Get that 2020 2nd round pick back. Sorry to inform you, that the 2020 second round pick of the Raiders is now a Chicago Bears pick, courtesy of Khalil Mack. I’ll have to patch together a new alternative unlikely trade to replace the current alternative unlikely trade. A 64 year old whose got nothin better to do than post 100 times a day and play lackey to Cohn boy. All you long time posters, dont support this Niner opinionist. He’s a fraud. Every time you post you give him a platform to trash the team. All the long posters have been banned because they challenge his incompetence. Do yourselves a favour and move on until till the PD wakes up and cans this wanna be Skip Bayless! 64 years old and saying the things you say. You should have pity on yourself. Sad state. Poor, poor Prime. He got lonely. so he comes back with his tail between his legs, trying to stir up trouble. I am happy. Many posters, and even Grant have been talking about trade backs. I do not know if they will be able to pull it off, but even some draft pundits are talking about how much leverage the Niners have, sitting at 2. Yes, even with the off season, this site is full, new posters have commented, and all are eagerly anticipating the draft after a stellar Free Agency. Posters seem to be civil and polite, and we are bouncing ideas around. I certainly have learned a lot, and really like Grant’s player analysis. So please, go crawl back under your rock, and leave us Die Hard Faithful 49er Fans in peace. Since some one is calling for a boycott of this site, I wish to extend an invitation to any new posters. We need more new blood, and I am hoping the Niners finally have a winning season, so posters can say they saw the optimism, and want to jump aboard the bandwagon, to help cheer the 49ers to the playoffs. I think the Niners are close to becoming respectable. and if they can avoid the injury bug, they can become relevant again. I like new ideas that may help the Niners win, and this is a diverse fanbase that has much wisdom to impart. It seems to me it’s the usual 4 posters with a couple of Mikes, Joes and Betty’s. This site has lost knowledgeable 49er fans. Now it’s football 101 for dummies. Hence Seb’s cheerleading. 64 and counting. Wow! Wrong, I quickly counted around 44 different posters, so it is a diverse group if you eliminate the trolls. There is a goodly amount of posters and almost 300 comments, is 300 more than we would get on your site. Yo, what up Prime? It’s been a while. Just one question: Are you on the Bosa train? I am Paul your friendly Sebastopol neighborhood lawn mower and I approve of this message! A)Pick 2 .. 4+24+(2019 4th)=2,622 that’s less than 1% over #2= 2,600. Lynch shouldn’t settle for less if Gruden wants a QB bad enough or the Giants 6,17,108 =2,628 pts. Then something like at 24 AJ Brown, Greedy W or B. Murphy. At 36 H. Butler or Safety T. Rapp. At 67 maybe OL. Another 4th rd pick, a 6th rd and 7th rd pick total of 8 picks. With the new FA’s and JG and the returning injured hopefully they get to the playoffs, at least close this year. I wouldn’t give up Bosa for anything less than two 1st round picks this year and some 2020 change. That drastically reduces your trading options… Giants, Oakland, and GB are your only possible trading partners I believe? I don’t really see Oakland trading up as they were the least talented team in the NFL by seasons end and have a ton of holes to fill. The Giants might but that would be for a qb. In this scenario I’m guessing Murray, Haskins, Williams, Bosa, and Allen are gone but Tampa is a bit of a wild card. As they might elect to go for an OT to protect their qb. I believe the only one of the names project to SF at 2 , that might slip is Allen. If he is gone by 6 and I am SF, I might pull a Seb and try for another trade back (hopefully not past 12) as I wouldn’t want to take an edge rusher outside of Allen or Bosa in the top 6. The message to those interested in the #2 pick with the most polished pass rusher on the board? Don’t go getting cheap on me! If Ari takes somebody other than Murray then I see a few teams calling Lynch trying to trade up for Murray. Or if Murray goes #1 maybe the Giants trade up to #2 w/SF but Haskins probably just drops to the Giants or even the Bronco’s. Does anybody remember the 2004 draft where we traded down twice, bypassing players such as Vince Wilfork (when we needed somebody to play alongside/replace a winding down Bryant Young), Stephen Jackson (when we had Kevan “I never met a hole I couldn’t fall down in” Barlow as our starting RB; particularly bad since he went to St. Louis and proceeded to murder us twice a year for a decade), Chris Gamble and Jason Babin (not Hall of Famers, but better than the trash we had at CB and LB in 2004). Hell even Michael Jenkins was a much more productive receiver than Woods, and we could have picked him, too. I’m not a huge fan of trading down unless the person doing the trading down has a history of being successful at it (Lynch doesn’t), and the coaching staff has a history of being successful at implementing those players traded down for into their systems (this coaching staff doesn’t). Could they get lucky? Sure. Is this an exact science? Of course not. Am I utilizing “Hindsight is 20/20?” Probably. 2000 – Julian Peterson. Great pick. Stellar LB until blowing up his achilles. 2001 – Andre Carter. DE. Not great, but not terrible. Failed to consistently generate pressure (except against Orlando Pace for some weird reason). Played 5 years in SF recording 32 sacks. He was drafted 7th overall. 2002 – Mike Rumph. Ouch. 2003 – Kwame Harris. Ouch. 2004 – Rashaun Woods. Super OUCH. Dude had 160 yards receiving, and 2 TDs in his career, and virtually all of that came in one game. And we bypassed Vince Wilfork to do it. Nobody associated with this debacle should ever work in football again. 2005 – Alex Smith. Like Carter, not great, but not terrible (though Aaron Rodgers was available; I guess one could argue that Rodgers would have failed under the Nolan/Singletary disaster spree as well). Because of where he was drafted and who we skipped, this can’t be viewed as a good pick. Though we did also get Frank Gore in round 3, so at least the drafting is starting to look up. Look at the influence Paraag had during those years. He joined the Niners as a full time statistical analyst in 2001, and was instrumental in shooting down Bill Walsh and John McVay’s trade proposals in the 2003 draft. They left soon after. Terry Donahue was a terrible GM, and Dennis Erickson did not have a clue. Mike Nolan was worse. Scot McCloughan helped rebuild the team, Simpletary talked like Tarzan and coached like Jane, and Baalke promptly dismantled a SB team. Throughout all this failure, Paraag was front and center, being good buddies with Jed. If the Niners want to have a successful draft, they should ban both Paraag and Jed from the Draft War Room. Harbaugh was blip alright he had very good talent and could not win a big game. Ditto for Michigan he has not been able to wein a big game whether it is against Ohio State or for the Conference championship or for the national championship. Believe me look at the records, if the game is not a “big” game ok they win but give him a lot of lense time and the teams lays a egg. I hope Michigan thinks they are getting value for thier 5+ million a year. That remark was due to Harbaugh being the coach of the only three successful seasons the 49ers have posted during the stewardship of the York family. Who would you rather have had during those first three seasons of his stint with the 9ers? Like him or not, the 9ers won lots of games and were relevant when he was the coach, and he’s been the only coach you can say that about since DeBartolo lost the franchise. There was a time when the 9ers were to the league what the current Patriots are, but those days are long gone. They’re much closer to being the Browns or Raiders than they are to being the Patriots or Steelers. JH basically took the same team Singletary had, even AS, and got to 3 NFCC Games and one Super Bowl. JH has not achieved the pinnacle of success, but I would call him a successful coach. He took 4 moribound football programs, and forged them into competitors. He gets down to the basics, has a firey competitive spirit, and knows football. JH is a master motivator, and deserved better at the Niners. I fully expect that with this last stellar recruiting class, JH will also be competing for a national collegiate championship. He has lacked a QB, and is short only a couple pieces from completing the puzzle. I wonder if Shea Patterson can run the up tempo offense. JH epitomizes what an American Head Football coach is, and the Wallmart pants are pure Americana. He may be a little too conservative, but if he is going up tempo, it sounds like he is growing, changing and adapting. Glad he is doing something I advocated for while he was coaching the Niners. Maybe it is his Offensive Coordinator, but that is smart of JH to delegate authority. JH also has the reputation, that attracts coaching talent. He had Vic Fangio here, and Don Brown at Michigan. Hope KS has made shrewd moves, hiring Kocurek and Woods. I hear what you’re saying Razor, but because this draft is so deep, loaded with promising, high level draft prospects through at least the first 3 rounds, I am hoping the 49ers are a little more open to dealing that pick, provided they get an offer worth doing. There are a couple reasons that the 2nd overall pick holds so much value. – The QB position: In the even that the Cardinals surprise some of us and take Bosa #1, the 49ers would then be able to auction off the rights to Kyler Murray at an inflated cost, because the QB position typically holds an inflated value regardless of the player. It’s also true that Murray’s Heisman winning skill-set is seen as directly transferable to today’s NFL. Interestingly, I think the NFL scouting community would feel differently about Murray, had he come out 15 years ago. – Nick Bosa = low risk / high reward. There is no such thing as a sure thing when a player makes the jump up to the NFL, but one need look no further than Nick’s older All-Pro brother to understand why Nick Bosa is widely considered one of the safest picks you will ever see at the top of an NFL draft class. The 2 brothers are near carbon copies, incredibly gifted both physically, as well as technically. Both guys have been coached up when it comes to the fundamentals, at a level rarely seen coming out of college. Trade the pick John!This draft is loaded thru the 5th round at least. If we can get in the 7 – 15 pick and a second this year and 3rd next year 👀 that would benifit us in the long run. We need to pick THE BEST DB IN DRAFT. D line can wait till the 3rd – 5th rounds now. They played Ronald Blair on the edge some little last year and was good in that role imo. Gotta get another linebacker early also. We badly need debth there its VERY IMPORTANT to the system we run. Btw… has anyone checked out Ronheen Bingham? He is a very interesting prospect that might fall to SF in the 3rd. * With Knee injury in Dec., more likely later…Maybe late 4th – 5th round? – I was curious if anyone had seen as (Take it for what its worth) PFF has him with the highest win rate in college football and he beat Jonah Williams for a sack in there game against Alabama. – I was thinking of him more as a SAM/ Edge guy rather than a strong side DE. – I wasnt aware of the knee injury… curious as to what it is. Pass. Justin Hollins or LC Collier are better later round bets. If it’s a trade down I hope with the Giants than so that we can select Sweat I like him more than Burns. But of course my first choice would be selecting Allen with our 2nd pick cuz we lack a Sam LB/Edge and he doesn’t quit on plays like Bosa. If they do trade back with the Giants, Bosa, Allen and Sweat may all be gone. Oliver, Gary, Ferrell or Burns could be good alternatives. I am hoping a modest trade back with Oakland, with Sweat as the first Niner Pick. 2) Edge: While Josh Allen carries my highest grade as an edge talent, he’s way behind Bradley Chubb from last year’s class. That said, this year’s group is much deeper overall. Allen and Montez Sweat have huge upside, but Nick Bosa might be the safer (though less explosive) option. Depending on whether or not teams reach for rushers, the strength of this position should be from about pick No. 24 until the end of the third round. Who do you think are the impactful edge rushers that can be had in this area? I think Allen, Bosa, Burns, Sweat, and Gary will all be gone by pick 24 Ferrell will likely be gone shortly after that… the next group of edge rushers would be Polite, Ferguson, Xmines and Jelks. I like Bingham in this area but there are some major questions considering the school he went to. Need to be lucky after the first wave . He’s a high character player and a team leader. Teammates and coaches rave about his work ethic and integrity. So no to Nick Bosa. This kid may have had some off field issues when he first came to college, but he’s owned up to them and is ready to prove himself at the next level. His sacks totals last season are no joke. Some pundits are predicting late first or early second. I don’t know if he had a pro-day since he was not invited to the Combine, but I’d be interested if he did. DL coaches from the Eagles, Cowboys, Dolphins, Vikings and Lions attended @LATechFB’s pro day to see a player who was uninvited to the combine. Edge rusher Jaylon Ferguson (6-5, 271) had a good workout, according to scouts there. Ferguson wasn’t invited to the combine b/c he was in a fight and convicted of battery, also charged with being drunk in public. He had a lot of sacks as a soph and senior. First step not very explosive but has long arms, strong hands, ran 4.82 but has tight hips and doesn’t bend well, his 5.12 ss and 8.03 3 cone shows it, that’s really slow. A day 2 draft pick. A report on him……….Bend/Flexibility – Big-time area of weakness. Very little bend or flexibility at the top of the arc, has to create a softer edge with his hands or cornering is out of the question. Can dip a shoulder a little bit to reduce his surface area. Speed/bend is not his forte as a rusher. if the Niners trade back, Ferguson should be on their draft board. Another intriguing player is Charles Omenihu. Obtaining Dee Ford has given the Niners more flexibility. I agree with the trade back scenario, but even if the 49ers decide to stay pat they will get a very good player at #2. Omenihu is a good find on the second day. We will also need to address the Oline. We may not find an Oline starter in this draft but we can find one that will be ready to replace Staley when he moves on or retires. AES, we might have one depending on how Coleman develops in Shanny’s system. They traded a draft pick for him, and they let Gilligan off the island. Tells me he showed them something they liked. I expect an OT brought in late through the draft or UDFA for competition…. Ha! I found the movie Coming to America, Arsenio Hall’ Rev. Brown “he helped Gilligan get off the island” but couldn’t put it on here. Old folks like me (who still use the Royal typewriter sometimes) are not very astute when it comes to the modern world. Going to have my grandkids teach me how to post YouTube videos. I will be happy even if they do not trade back, and get a player who will help the team. Razor thinks there is elite talent even up to the middle of the first round. I think there is first round talent even at 39. Trading back and getting pick numbers 35 or 37, would really help with the rebuild. With that 35 or 37, they could pick an O lineman. Maybe one who shined in the Senior Bowl practices. Williams, Bosa or Allen would all be solid choices, but trading back and still getting Sweat, Oliver, Gary, Burns or Ferrell is the scenario I like best. Hope they listen to their scouts. I am liking Oliver even more, after watching film on him. He is cat quick. I hear you. But great players can come from small schools. Remember, that we drafted a guy who came from a small school named Mississippi Valley State that turned out pretty good. The NFL is chock full of great players who have come from small schools as well as Bust players who came from major university’s. I’m sure that we’ll see some players in this draft that come from small schools that will find success in the NFL. I hope we can find a couple. Ben Banogu (TCU) and Maxx Crosby (E. Michigan), might be diamonds in the rough. I also like Oli Udoh (Elon). He might be a nice later round pick that helps build the O line for the future. He went head to head with Sweat at the Combine. I am wondering how much the coaching at the Senior Bowl will affect their assessments. Hope it helped. I am hoping they trade back, and get Chris Lindstrom in the second round. Our Sam LB had 62 snaps in coverage in 2018, and why Burns’ inexperience in dropping into coverage compared to Allen’s is insignificant…. * EDGE: Austin Bryant, Clemson: End of the 3rd round or early 4th. coaching and a year or two to develop into a starter. Most oily and unlikable owners in the league. 5. Mark Davis, for moving out of Oakland. Jed is disliked by the fans, but he is more incompetent than oily, or morally corrupt. Thankfully, he has hired JL and KS, and they are rebuilding the team, brick by brick, and changing the culture of the team. smh. Jed is still punching walls. Hope he grows up, and learns not to punch studs. Notice I didn’t include Jerry Jones. Jerry has gotten wiser as he’s gotten older. He’s displayed great loyalty to his players and coaches. He’s been working on a study for players and CBD for the past two seasons. He runs a successful family business. * “Jerry has gotten wiser as he’s gotten older.” * LOL: That and putting his Son, Stephen Jones, in charge of the draft? decision? Maybe JJ should put Stephen in charge of PR interviews too? Garoppolo told reporters on Tuesday that he spent time watching film with Mike Shanahan in December, according to Nick Wagoner of ESPN. Great! That means he wants to improve himself. Sounds like he earned a lot from the interactions of Belichick and Brady. I’m hoping to see JG make a full recovery and comeback. Spending time with Shanahan (and news that Jed punched a wall when JG went down) only validates how much the Org is putting their future on him. If Jimmy G can stay healthy and clean it should garner 8-10 wins this year. Cardinals at No. 1 overall, have been linked to reigning Heisman winner Kyler Murray with the first pick. Should they make that selection, the remainder of the draft will be turned on its head. For their part, the 49ers have been linked primarily to Ohio State edge rusher Nick Bosa, who is largely considered the No. 1 overall player in the entire draft. Head coach Kyle Shanahan and Co. are sitting pretty with that selection. Should Murray go to the Cardinals with the first pick, Bosa becomes the most-likely scenario. Speaking to the media at the annual NFL meeting in Arizona on Tuesday, 49ers head coach Kyle Shanahan reiterated that the team is willing to move down from the second spot. Pro Tip: Sometimes I can’t get that stench off my big finger so I use 20 Mule Team Borax and that does the trick every time!!! Dude (whoever you are) get lost! Your “finger” take was never funny. Actually, creepy describes it better. Seb, It seems that finger ailment has bothered you for awhile now. TomD, my problem is that while dealing with trenches and pipes, I sometimes am forced to deal with sewer pipes. Sometimes, I have to deal with Sh*t up to my elbows. Even on this blog. As in the case with Baalke and these burner blog trolls, the stench never goes away, no matter how much you scrub. But that stench is on them, not me. Being a seasoned pro, I shower every day, and use Lava soap because it contains pumice. Let me also add that out with the finger, in with the Borax sometimes leads to other benefits. Ants 🐜 take the Borax back to their colonies and now you’ve ridden your bum of that awful pest problem! I’m an old man that has no business giving anyone advice. But I would only say, don’t grovel with these guys? Guess you do not follow blog protocol, but most blogs eliminate the catfish accounts. I am also glad we can have a civil conversation about a team we love. You bring a lot to this discussion, and I appreciate your kind words and good advice. I try to ignore the trolls, but that just seems to encourage them. I–even I …..AM THE CATFISH!!!!!!!!!!!!!! You so called me this years ago……….you cannot now take it back!!!!!!!!!!!!!!!!!!!!!!!!! Saw, at least you admit it, and I do not consider you too obnoxious. This is the reason why catfishes should be deleted. Reply: Apparently it will take Arizona drafting Bosa for Grant’s dream of Allen to the 49ers scenario. I’d be fine with Allen. But I don’t see him making an immediate impact. But he will be a pro bowler in 2-3 years. THANK GOD….the Owners voted down the overtime fourth-and-15 proposal. I thought you were deeply concerned about player health–you know, reducing risk of injury? Encouraging falling down? No patting heads? Guess you still like the idea of players running into each other full speed on kickoffs–even onsides. Cassie, this goes to the heart of the game. Changing the rules in such a willy nilly manner destroys long held traditions. Believe it or not, there are concussive forces delivered every play. and the game is trending towards flag football. I hope they make the game safer, with better techniques and better equipment, but that 4th and 15 rule is just Pee Wee football, which you closely associate with, every time you tout the aaf. Try, try, try just a little bit harder. The espn talking heads were speculating that if Az goes after Murray that they’d probably only get a 2nd round pick in a trade for Rosen; not a 1st. That surprised me. A 2nd would seem like a good value for Washington, Giants, Chargers, or Dolphins. “Around NFL teams and in the national media, the assumption is the Cardinals or another team will select Oklahoma quarterback Kyler Murray with the No. 1-overall pick in the 2019 NFL Draft. At No. 2 therefore, there is a consensus that the 49ers will take Ohio State defensive end Nick Bosa. From speaking to 49ers sources, however, the team is very torn on who to take with that pick due to loving Alabama defensive tackle Quinnen Williams. Multiple team sources were more enthusiastic about Williams than they were about Bosa at the NFL Scouting Combine and in the week afterward. Sources with the 49ers were gushing about Williams. They think he is a rare prospect with an amazing skill set of speed and athleticism. Team sources also like Williams’ makeup as an individual, and they are very high on his immense upside. Team sources were gushing about how Williams dominated in 2018 in only his first season of real playing time. They feel that the sky is the limit for his potential. With Bosa, their praise was not as effusive. They like him and feel he is probably the safer pick, but they did not talk about him as being as special of a player or athlete like Williams is. The other thing going for Bosa is edge rush is a bigger need than defensive tackle. Defensive end Solomon Thomas has been a massive disappointment in the pass rush department, while defensive tackle DeForest Buckner was superb last year, ripping off 12 sacks in his third season. Hype and misdirection. Anything is possible. I did happen to read this a short time back. There are so many voices this time of year regarding the draft that you can take your pick on who to hear/follow . Lynch recently said that he will look at the BPA which could be pointing at QW. Honestly, we won’t know until this time next month who will be introduced as our top draft pick. I’ve heard that the 49ers love Minkah Fitzpatrick. If it weren’t for Reuben Foster’s uncertain future in the NFL, Fitzpatrick would probably be an easy pick for San Francisco. However, Foster’s NFL career could be over, which would leave the 49ers with a huge hole at linebacker. In the final hours before the 2018 NFL Draft, Foster’s girlfriend and alleged victim said he’s innocent, so perhaps that will push San Francisco back to Fitzpatrick. As for the safety need, Eric Reid is expected to leave in free agency, while Jaquiski Tartt and Jimmie Ward are in the last year of their contracts. Fitzpatrick would be a great scheme fit and could help form a talented secondary with Richard Sherman and Akhello Witherspoon. Roquan Smith is a great scheme fit for San Francisco as well, and he probably reminds John Lynch of his former teammate Derrick Brooks. I get the impression the 49ers are going back and forth on Smith or Fitzpatrick; it’s very close and could break either way. I think they keep Rosen, as insurance. There is no guarantee that Murray remains unscathed all season. Rosen would also benefit from sitting, and learning, studying the playbook while working out to get stronger. Then, towards the end of the season, when QB attrition hits, Rosen may garner a first round pick from a desperate team. As we get closer and closer to the NFL draft, there will be more and more talk suggesting the San Francisco 49ers should trade back. The question then turns into whether or not the value is worth the trade. Instead of discussing the players, let’s take a look at the history of trading. Warren Sharp, creator of Sharp Football, put together some detailed analysis on this very subject. One of the most difficult decisions teams make every year is valuing if a player is worth an extension. If that player isn’t critical to your team, it’s smart to let another team overpay. This is how you are awarded one of the 32 compensatory picks that the league hands out every year. Being on Injured Reserve can be a lonely place. Jimmy Garoppolo, who tore his ACL in Week 3 against the Kansas City Chiefs, was around the team facility almost every day following his knee surgery. But there was only so much he could do. “It was frustrating because Jimmy is our guy, and all I want to do is work with him, but we had to prepare all of these other quarterbacks each week when we’re game planning,” Shanahan said. It turned out that there’s a benefit to being part of a football family. Shanahan’s parents visited during the month of December for the holidays, and the San Francisco 49ers head coach turned to his father, Mike, for a solution. Mike ended up coming into the facility to sit with Garoppolo and watch tape. Mike, a two-time Super Bowl winning head coach with the Denver Broncos, spent a bulk of the month hanging out with the 49ers franchise quarterback. The only reason they’d take Williams is because they’ve soured on either Thomas or Armstead, and I think it’s too early to pucker on Thomas. If Bosa is there, he’s the pick because he fits better with how the team is currently constructed…. Disagree. I think we’ve seen enough to pucker on Thomas. The guy is decent against the run but he can’t rush the passer. He made absolutely no improvement in that department from year 1 to year 2. The 49ers drafted him for a specific purpose and here we are in year 3 about to spend a top 5 pick AGAIN to do the exact thing Thomas was drafted to do. If Solomon Thomas was a 6th round pick we drafted as a rotational d-lineman who could help against the run then we’d all be ecstatic with Thomas’s play. But that’s not the situation. When Thomas played his natural position, and Buckner was at 1t; he had the third highest single game grade of his career against the Rams in October. Thomas’ pass rushing productivity through the first 7 weeks of the 2018 season with sixty interior snaps was ranked 9th best, which was just behind Buckner who sat at 7th best. I’m very much expecting Thomas to have a breakout year under Kocurek in 2019…. I wish I shared your optimism. When I see him play I don’t see him split the blocker to gain leverage – ever. He seems like a traditional 2-gap d-lineman that’s good against the run but not so great when you’re rushing the passer. It’s possible the 49ers are playing him out of position or he’s being coached poorly but at the end of the day it’s about production and he hasn’t been productive as a pass rusher. The team drafted him as a pass rusher so it seems like a wasted high 1st round pick. When I see him play I don’t see him split the blocker to gain leverage – ever. Despite not being bendy, Solomon Thomas scored in the 94th percentile in SPARQ, which you’re probably aware measures athleticism. Way too early to go pessimistic, even though to this point he’s been a disappoint from a production standpoint. I’d like to touch on an intangible. His sister’s death. He played through it last year. Where has that process left him emotionally? My bet is he comes out the other side stronger, and will dedicate this season to her memory…. So if you believe Thomas will have a breakout year and the 49ers just traded for Dee Ford then why do you advocate for picking Bosa? Do you envision a lineup on pass rushing downs as Bosa and Ford on the Edge with Buckner and Thomas on the interior? Where does Armstead fit in if you see Thomas as a 3 down player? The 49ers will move on from Armstead, provided Thomas moves forward. Interesting. I’m not a huge Armstead fan but I think he’s better suited to the 3t strong side than Thomas. This year will be very telling for Thomas. He plays the same position as Armstead and has been given every favorable opportunity to take it over. Sadly, Armstead has been the better player at the position. We drafted two 1st round players to rotate at the same position… not smart. Now we are talking about Taking Q in the first. I do not trust Lynch as the GM. I agree. Kocurek will be better than Zgonina. Woods will be better than Hafley, so the DBs will actually cover receivers. That will give the pass rush time to get to the QB. Interesting that Kwon Alexander, who’s been in the NFL for 4 years, is 4 months younger than Reuben Foster. If Shanalynch considers him to be a long-term solution, it’s a very expensive fix to the Foster problem, and one with some degree of uncertainty. I was just listening to an interview with Lynch on 49ers.com. He said that they consider Alexander to be a long-term solution and will wait “as long as it takes” for the ACL. I think the team should look at Jamie Collins. He didn’t have a great year last year but some think that that is because he was disinterested playing for the Browns. As the article below notes, he had 4 sacks on 140 pass rush snaps whereas Ronald Blair had 5.5 on 338 pass rush snaps. He’s not a direct replacement for Alexander but is very versatile and can stop the run, cover receivers and rush off of the edge. The team has shown that they like versatile players so why not Collins? I actually like Jamie Collins. He could even play SAM with Alexander and Warner on the field, or be in for Alexander while he recovers from the ACL. Thumbs up. The team has shown that they like versatile players so why not Collins? I assume that they have considered him and then decided against him for some reason or the other. Maybe a conversation with BB? I saw that story earlier and if the account of Collins not being interest in playing for Buffalo is true, that becomes a game changer for me. Some here have expressed their concern about Bosa supposedly quitting on his team. Jamie (if story is true) is not far behind in my view. Another possibility in Collins’ story could be that he is no longer the player that he was early in his career, which I tend to lean on. I’m a no, on Jaime. NFL owners have passed for one year only, pass interference — both offensive and defensive — will be reviewable, the first penalties and judgment calls ever to be added to the list of approved reviews. Moreover, coaches will be able to challenge non-calls for pass interference. The replay booth, in conjunction with the league’s officiating office in New York, will initiate those challenges in the final two minutes of each half. Meanwhile, owners made two expected votes earlier Tuesday. They made permanent the 2018 changes to the kickoff rule, which had been made on a one-year trial basis. They also voted to eliminate all blindside blocks, not just those to the head or neck area, to increase safety on punts and other plays. Owners also approved a proposal that gives teams a choice in the timing of enforcement on a personal foul or unsportsmanlike conduct after a scoring play. The yardage can now be marked off either on the extra point or on the kickoff. In other voting on rules, the NFL tabled a proposal, originally put forth by the Kansas City Chiefs, to guarantee each team a possession in overtime. The league also defeated a proposal from the Denver Broncos to give teams a one-time option in the fourth quarter to have a fourth-and-15 from their 35-yard line as an alternative to an onside kick. No one is as happy as Sean Payton. But it came one year to late for the Saints. If you wanted to know why Bengals President Mike Brown was the only owner to vote against the instant replay change that allows offensive and defensive pass interference to be reviewed, go back and look at Bengals founder Paul Brown’s thoughts on the subject 40 years ago. “We have been against it all these years. The reason we are against it is it interrupts the flow of the game,” Brown said. “It changes the character of the game. It’s odd to me to see all these people waiting on someone in New York to tell them it is or it isn’t. “I’d rather just play the game.” Brown has never been sold on the notion that the better the technology gets, the better chance the league has of correcting error. “It’s the fact instant replay doesn’t always correct it,” he said. “It compounds it on occasion. There is no answer. ‘Oh, there won’t be any more bad pass interference calls.’ I don’t think so. They’ve never had instant replay for judgment calls. I don’t know how it all sorts out. Maybe it works great. I have my doubts. Brown does have a point. Though still under the 2 challenge rule, it’s not like we’re going to see replay calls on every pass play. Mark my words, Brian Burns will not be drafted in the top 20. Burns is 6′ 5″, 249 lbs, and ran a 4.53 forty with a 7.01 Three cone drill. In 2018, he had 52 tackles, 15.5 TFL, 10 sacks, 3 PD, 3 forced fumbles and a fumble recovery. His 3 cone was better than Bosa’s. Oh, I really must have hit a nerve, Paraag is sending his minions to attack me. He’s seen as a late first to early second around the scouting circles. He’s been dropping a little lately. Maybe Burns goes from 14 to 23. You might be right, but where Burns is drafted does little to minimize his potential to become an impact player at the next level. Of all the top defensive players who were being touted in the first rd in the draft last year, it was Darius Leonard a second rd pick who had the biggest impact. Btw, Leonard’ combine numbers were very similar to Burns. I see Burns going anywhere between 15-28 of the first rd. He’ll be a steal if he falls to the second – maybe like Leonad was. Why is the draft so important? Because it is the main way teams improve. Sure, Free Agency can fill some holes, but when planning for the future, locking up young players to rookie contracts is the best way to build for the future. Sure, the draft is an inexact science, but look at the Niners during the Glory Years They consistently picked towards the end of the first round, but still made the playoffs for 16 years. Bill Walsh was a draft maven, and he picked winners. He also had a few clunkers like Todd Shell, but that ’86 draft was masterful, and almost resulted in a Threepeat. How does one decide who to draft? They should give JL all the pertinent parameters and assessments, and let him make the call, utilizing his experience, intelligence and game knowledge, to make the final decision, not some analytical algorithm. He should take counsel with KS, but not let KS dominate the decision making process, because KS selected CJB, Joe Williams and Pettis, while trading away Brown who helped the Pats win a SB. They should give the scouts who found Kittle, Colbert and Taylor, an edge in the assessment process. This draft is incredibly important, and could be the difference between having a winning or losing season. The Jets want to trade back, because they traded up with the Colts, and the Colts went from 4-12 to being in the playoffs. Now, I saw a mock where the Bucs took Dwayne Haskins, so the Giants are almost forced to trade up, if they want Eli’s replacement. Sounds like Arians may be thinking about improving the QB situation, and Winston may be good trade bait. Bucs may even want to trade up with the Niners, so I hope the Niners have several trade back partners in place before the draft. Sure, it takes 2 to tango, but they may get into a bidding war. In this next month, I hope to have 5 more mocks. Hope the Niners are crunching the names, and running through various mocks using easily available programs. Keep your responses to 140 characters or less, peasant. The 9ers had great drafts in those years but if you check they had terrible luck with their late 1st round picks. They killed it after the 1st round. There is something about the 9ers and late 1st round picks that makes them want to reach. After a late 1st round busts they have had some great 2nd and 3rd round picks. OC, I hunger for another ’86 draft. Charles Haley, Steve Wallace and Kevin Fagan in the 4th. Don Griffin in the 6th. They avoided the first round bust syndrome by trading out of the first round! Lynch has drafted Solomon Thomas and Foster in the first round. His drafts have not been good so far. Another trade back scenario. Niners trade back with Tampa Bay. Tampa Bay gives up their first, second and fifth round picks ( 5, 39, 145), along with a 2020 second round pick. Arians and Tampa Bay are moving on from Jameis Winston, since he was benched for Fitzpatrick, and will trade him to Miami for a second round pick, to recoup the one they lost this draft. Niners end up with picks 5, 36, 39, 67, 104, 145, 176, and 212. Niners miss out on Bosa and Allen, but still have Sweat, Oliver, Gary, Ferrell and Burns to choose from. Btw do you think I am a handsome chap, eh Sebbie? Seb….Ryan Fitpatrick on Sunday just signed a 2yr/$11M contract with Miami that can boost up to $20M. Miami sent Tannihill to Tenn last Friday for a couple 2019 late picks and a 2020 pick. PHOENIX — Here at the intersection of Jameis Winston and Marcus Mariota, there is a fork in the field. Both quarterbacks are in the fifth and final year of their rookie deals. Winston, picked No. 1 by the Bucs in 2015, has been told by his third head coach, Bruce Arians, that this is..’his team’..and he does not want Winston looking over his shoulder. The Bucs seem pre-occupied with his fragile phyche and his fumbles. Jameis has said he’s going to focus on being healthier also gaining muscle and come in at 250lb. The Titans worry about Mariota’s fragile physique, picked No. 2 overall by the Titans the same year and with one playoff win to his credit, has trouble staying healthy and has been served notice that there is competition in the building. The Titans traded for Dolphins starting quarterback Ryan Tannehill and released Gabbert. Gabe, Winston was benched for Fitzpatrick, and Arians also said he would be evaluating every position. Winston is in his last year of his rookie contract, and the Bucs may not want to extend him the big bucks. Since some draft pundit mocked Haskins to the Bucs, there may be some truth to the rumors. The Bucs may have made it to the playoffs, if only they had a QB who did not throw the ball to the DBs. Yes, Arians may be blowing smoke, and if they manage to obtain the QB they covet, Winston needs to be a big boy and play the hand they dealt him. I remember Arians, touting Gabbert, saying he was the best QB for the team, then watched as Gabbert benched himself. There is a reason why Fitzpatrick is on his 8th team. If you believe Fitzpatrick will be the franchise QB of the Dolphins, I admire your optimism. I just think he will pull a Gabbert, and bench himself. Also, Winston is hearing footsteps. The Bucs just signed Gabbert. What a stirring vote of confidence for Winston. Arians loves Gabbert. I’m glad for Gabs. Hard working guy who players and coaches seem to like everywhere he goes. There’s a lot to respect about Gabbert, just a shame he hasn’t put it all together because he has the attributes. Goes to show what being in a bad situation can do to a player. He started Gabbert last season. Arians didn’t coach last season, but yes he did start Gabbert in 2017….because he was a backup and Carson Palmer got injured. My bad. Duly noted. 2017. Your scenario was way off Sebs, admit it but you can’t. Do your homework, this happened last weekend with Miami. Winston must be shaking in his boots big bad boy Gabbert’s in town. Arains told Winston this is his team and your boy Fitzpatrick split town, not your scenario. SF will be lucky if any teams trade up, a few polls say Haskins probably slides, maybe even Murray, probably not. Frank, I did not advocate for a trade up with the Bucs, until some draft pundit mocked Haskins to the Bucs. I will fully admit I may be wrong, but stranger things have happened. This is all just off season speculation, not some pronouncement that will never change. Yup, Arians declared Winston the franchise QB, then promptly signed Gabbert. Every team Gabbert goes to, the starting QB tends to get injured, so Winston better rub his lucky rabbits foot. Interesting. If I had such personal animosity, Why did I root for Gabbert to lead the team to victory? I did not bench Gabbert, he benched himself, just like he has done everywhere he went. I will wish him well on the Bucs, but am glad JG is the franchise QB for the Niners. Gabbert might out compete Winston, but I think history will repeat itself. Frank, I was the first on this blog site to speculate that Murray will be the first pick in the draft. I was met with howls of derision, and posters gleefully stated that Murray was not even on the draft boards. On the CBS draft board, Murray is still behind Haskins, and is ranked 14th. On Draftek, at least Murray is ahead of Haskins, and ranked 7th. Niners may need luck to get a good trade back deal, but this is a QB driven league, and there is a ton of speculation surrounding that Niners’ number 2 pick. Giants exploring trade for Rosen. Hmmm, sounds like they are looking for a QB…. How in the world did you come up with that spectacular deduction? Wow, stellar conclusion! Some might have thought they’d trade for Rosen and line him up at Edge, or maybe Free Safety. Actually, I think they may not get Rosen. Kingsbury will not want to put all his eggs in one basket, and Rosen would be a good backup, where he could sit, study and work out to get stronger. Jay Gruden mentioned that Rosen was unavailable, so unless the Giants throw a boatload of picks at the Cards, it seems impractical. Gettleman seems to want to lowball teams, and make bad trades that only favor his team. I am glad the Giants are looking for a QB. If they want Haskins, the only way to get him may be to trade up. This is good news for the Niners, and makes their second pick even more valuable. Can’t you work a couple of more cliches into your gibberish? Red, you seem feisty today. Go troll some one else. Oh, and I was being facetious, but that went right over your head. Pay attention. Yawn. Hope they make payroll, or it will collapse like a house of cards. Rib I was born in 1955. Glad to see you touting Pee Wee Football. That is about your speed. But you are alive, I’m guessing, in 2019. The point is, the AAF may be the next AFL, or the next USFL, it may be become the NFL’s version of A league, triple A league, or none of the above. Only those full of themselves profess to possess a crystal ball..
Yeah like me, with my constant postings that so and so is a sure bust, so and so can’t do this or that in this league, so and so will be a better pro than so and so, the team will be set back years if they draft so and so….ad nauseam. Yeah,that’s just like me. Yup. Hope you can find where I said anyone was a sure bust. While not a fan of Bosa, I have also said I would be happy if they draft him, because he will improve the team. Whereas your snark is as predictable as the sun rising in the east. I make suggestions, hoping to improve the team. Maybe you are too sensitive, and whine if I make any constructive criticisms. Yes, I post a lot, but this is the off season, so there is a lot of speculation about the draft. I have been happy with Free Agency, because they actually spent cap space. Maybe you, and posters like you, should just stick to football. Dazzle me with your insights. Impress me with your football knowledge. Write something intelligible, with facts to back up your point of view. I am not going to hold my breath, waiting for a cogent thought to leak out of your brain, but go ahead, tout the aaf like it is next best thing since the European League. I could use the laugh. I’ll do something so utterly foreign to you, the brief succinct reply, it might make your head explode. I just love it when Sebbie gets his nose so high in the stratosphere. No one is asking him to be a fan of the AAF. Nada. The fact that he can’t see/won’t see ANY value in it, and piously dismisses it as pee wee says much more about Sebbie’s feelings of inadequacy than anything about the AAF. Cassie, your fascination with the aaf is endearing. Glad you finally have found your calling. Go ahead and waste some one else’s time talking about the scrub league. I am more fixated on the draft. Sounds like you associate yourself with inadequacy, so the aaf is right up your alley. Only an NFL shill like Baalke would be touting such a poorly managed and played league. I do not follow the Arena League, either. Right now, I am eagerly anticipating the start of the SF Giants season, and my son wants to watch the Warriors playoffs with me. Go troll some one else, You seem to be getting desperate. There could be a lot of value in the AAF for the NFL. Football is the only major league sport that doesn’t have a feeder system post college. Who knows? There could be a diamond in the rough that gets a shot because of his play in the spring. Who’d have thought a Pro Football HoF QB would come from the Arena League or Canadian Football League? Listened to Maiocco’s podcast with the interview with Don Yee. He’s a co-founder of the Pacific Pro Football leagues that starts in July 2020 for 18+ old aspiring NFL players as an alternative to college. Has some backers who0 are ex-NFL players like Ed McCaffrey and Mike Shanhahan is on the Board of Directors. I hope it finds success. This NCAA shamateurism needs to end. That’s why I think we’d target 3rd degree Burns over Allen in a trade down scenario, simply because Sam is the least important position. The argument for Allen over Burns is mostly due to his ability to drop into coverage, which we simply don’t do enough to justify Trumping 3rd degree Burns’ better pass rushing skill…. Metcalf could be a good pickup in the second or third round, but the man needs to lose some of his muscle mass and confined to a yoga center for a season or two. Why? Did he struggle getting open at his size in college? Metcalf has high first-round bust potential. Posey lists the key reasons. Metcalf’s biggest drawback is his injury history. He may be a little stiff in the agility drills, but he will be a load to take down.His speed will make his route running special. I also surmise he will be a fantastic blocker against DBs who weigh 40 lbs less than him. The Niners could possibly solve their red zone woes if they obtain Metcalf. Posey declared Allen has bust potential? He does not impress me with his football acumen. Bet Grant disagrees with Posey. Why the heck did they hire a Chargers fan for the NN blog? A little stiff? Seb, statues like Brady were less stiff in the agility drills. He can be as stiff as he wants, if he can run through DBs, and not run around them. He can’t Seb, hence the problem. Well you know me. I have been mocking N’Keal Harry in most of my mocks, because he may be available in the second round. Hope they get their pass rusher in the first round. Yeah, except he was very good at beating press and getting open in college. His low agility scores are being waaay overblown. Most big WRs don’t even do those tests, because they know they will test poorly. Metcalf doesn’t win routes by making sharp cuts. He doesn’t need to. The key word there is college. Yes, big key word… except every single draft prospect is in the same boat. College Football is all we have to go off I’m afraid. Sorry about that. My point is that he won’t be able to get away with what he was able to do and not do with the Rebels. Watching his tape, I have seen a number of times that Metcalf has pushed off on the DB covering him in order to catch the ball. And while he is a matchup nightmare, Metcalf has shown an issue with consistency, whether it be with catching the ball, blocking, or overall effort. The limited tree route running is not really his fault, but it seemed like Metcalf kept being put on the left side of the field by the Rebels, and that begs the question of why that was. It also needs to be asked why the Rebels offense went through Brown instead of Metcalf. As for his three cone time being overblown, that statement is not really accurate because his issues with separation show up when Metcalf needs to quickly change direction. Finally, Metcalf’s injury history is a concerning red flag as he was only able to complete one full year in full health. Given all of this, I would avoid drafting Metcalf during the first round of the draft and would not be surprised if he ended up being a bust. I would not consider the injury issue a red flag. He broke his foot one year, and he is fully recovered from a neck bone fracture, not impacting the spinal chord. Those are random injuries, and not an ACL. However, I would not spend a top 10 pick for Metcalf, and there are many good WRs in this draft. This discussion was about Metcalf’s lateral agility being an issue, so I’ll keep the focus on that aspect of your response. Not specifically about his agility, but could be construed as being related. Yes, it is a question worthy of being asked. But they limited Lodge as well. I think it is a product of the offense and putting guys where they believed they best fit in that offense. While I don’t think he’ll ever be great in routes that require a lot of change of direction, there are other routes they could have had him run but chose not to. Again, not specific to his lateral agility, but could be construed as related. But it also isn’t really the case. Production of the two was not that dissimilar while both were healthy. Metcalf was just less volume, higher big play percentage. People had the same concerns about OBJ vs Landry – I said at the time it was overblown and a product of how they were used, and the limitations of the QB, not their ability, and we’ve seen how that worked out. Yes. But when asked to do what he is good at he is good at getting separation. Don’t make him something he isn’t. What makes him dangerous is his combination of elite physical attributes of size, strength, speed and explosion, combined with excellent footwork and arm/ hand usage at the LOS. He’s like TO. Use him as such. There is a reason almost ever other receiver of his size has refused to run those drills. Not even the greats like Calvin Johnson would have done well at those. Thanks, cubus. I’m starting to read this guy. His articles are well written with non wishy-washy opinions. If what he says about Allen and Metcalf are true, neither would be worth a first round pick. Hopefully, not for long. That statement does not impress me with his football knowledge. Heck, Germinator may be a better Niner Nation blog host, and we go way back. It’s the PFF argument. In the NFL you have to stop the pass. So in that sense, stopping the run is overrated. I think Belichick disproved that premise. He shut down the run game, and made the Rams one dimensional. You know the Lambs left 14 points on the field that should have easily been scored. Those were routine points an avg NFL player should have converted. Bellicheat had nothing to do with that-tho he is the best coach of his generation. That being said, the Chiefs will surpass them if Reid gets himself a D.
Saw, Belichick schooled McVay, and Sean admitted that. Rams should not have been in the SB, but the new rule comes a year late. Personally, I think Defense wins championships, and that includes the Run Defense. Reid just lost Ford and Houston, so he needs to rebuild, not reload. It was more complicated than that imo. Basically he shut down both simultaneously. Goff wasn’t good enough to carry the offense. You have to be able to do both, so don’t agree with that statement. That’s very true. I wasn’t saying run defense wasn’t important, just that, compared to pass defense, it was overrated. Maybe he meant that devoting too much resources to run D at the expense of pass D is not a good strategy. If a team can’t stop the run, there is very little incentive for the offense to throw. Agree, George. While I don’t care for constant hot takes, the previous guy at NN was “wishy-washy” to say the least. I’m actually surprised how quickly Posey has come up to speed on the 49ers given that he was in charge of the Chargers blog for a number of years. I saw on NN, that JG was consulting with Mike Shanahan. Good move. Maybe KS should hire Mike as the Niner OC. Mike would help with the details, and prepare the offense better. Big Shanny is in a secure, undisclosed location within his offensive bunker laboratory preparing a blindfolded Jimmy in the art of kung fu quarterbacking…. Hmmm, playing with the grandkids or talking football with JG…. I’ve been leaning toward Williams from the beginning, but your article now has me firmly entrenched in the Quinnen Williams camp. Realizing the Aaron Donald comparisons to any DT coming out the last few years are over the top, I asked myself, what if he’s better, or a notch under Donald ? In either case, you have a perennial Pro Bowler from day 1, right?…The same can’t be said of Allen (unpolished counter moves); Bosa (injured–only played 3 games last season, lacks bend/flexibility around the corner, and too short for end) and the others, all come with acquire at your own risk sign. Williams is the only one who future carry’s the sign–incredible upside–Aaron Donald like ! There are those who say drafting Williams is redundant—we already have a bevy of players at DLT…..
To those I say, that still hasn’t stopped the Buckner double teams, who may have had 20 sacks instead of 12 w/o them….I also noticed the opposing DC’s sprinting to their D-Line rotations to double Buckner anytime Armstead, Jones, Mitchell (who we still need to replace), or others entered the game. In other words, our D-Line rotation scares nobody–only encourages the Buckner Double teams. So until we draft Williams, the only person who is frightended on the field is the 49er’s, Buckner, wondering when the hi/low (chop block ) is coming to end his career. Another reason to draft Williams is the 49ers exercized the 5th year option on Armstead meaning this year will be his last (unless he steps it up), and Solomon Thomas scares exactly, nobody!!! He didn’t have no where near the sacks or explosion or moved Donald did and has. Just stop with the comparison of the two. I remember one JJ Stokes who dominated college football and was touted as the next great 49ers WR. JJ never became the player who kill’d it in college. Good thing T. O. came in the following year to help us forget about JJ (well sort of). Yup, I agree that comparisons can be a little shaky sometimes. It’s always best to begin the comparisons convo once we see these guys play against the big boys. AES… exactly. HOF NT don’t grow on trees. In fact they come around every so often. Ones that can stuff runs and kill QB’s that is. If I think back to a true dominate player through out his career in the middle I’d have to think Sapp. Yes there has been others that were very good. But Sapp and Donald are on another level. Yup, Sapp was special. But one of the best I’ve seen is Lee Roy Selmon of the old TB Buccaneers. Selmon destroyed Olinemen and RB’s. He was a great player on a horrible team. Poor guy deserved better. 1. The Cardinals will select Kyler Murray and trade Josh Rosen. 2. Arizona will trade this pick to a team – probably the Raiders – that will want to choose Murray. Either way, Murray will be the top choice in the wake of his positive measurements at the combine. The 49ers are currently deciding between Nick Bosa and Quinnen Williams. Charlie Campbell reported a week ago in the NFL Hot Press, as well as the mock draft video below, that the 49ers appeared as though they were falling in love with Williams. Charlie’s report looks even better in the wake of the 49ers acquiring Dee Ford from the Chiefs for a 2020 second-round pick. Williams had a breakout performance this season, and sources Charlie Campbell spoke to early in the season believed Williams would be a high first-round pick. Williams is now a likely top-five selection. If Sweat can show that he can effectively drop into coverage, his stock is going to be in the top 5 pick range. How is that surprising Razor? He is already expected to go in the 5-15 range. Because he’s basically a good solid player with starting ability, and his game isn’t as elite as his combine. I just don’t see him as a double digit sack artist in the NFL. I don’t know, maybe he is…maybe he isn’t…. Yeah, good player, but his film does not match his combine numbers. Top 10 is too high for me. We’ll just have to disagree on that. To me, Sweat’s combine showed what I saw from the tape on him. I should add that I personally would not take Sweat with a top 5 pick and feel like the addition of Dee Ford eliminates any viable reason to draft him. It’s interesting that so many love Sweat when he, like Allen, uses very few moves, and wins at a fraction of the rate Allen does. Sweat is a speed to power rusher that gets walled off too easily in pure speed rushes because he corners like a drag car. However he is relentless, and will get hustle sacks on qbs that don’t get rid of the ball. I like him, but more in the 10 to 20 range and with our current lineup I would choose Burns over him even as a situational rusher. The most realistic and practical trade back scenario, may be for the Niners to trade back with the Raiders. Gruden says that it is really hard to find a good pass rusher, and according to Razor and many draft pundits, Bosa is the best pass rusher in the draft. Gruden may also be blowing smoke, and may be targeting Haskins, and will trade up to secure him, because several teams are also looking to Trade up with the Niners. Gruden will not want to give up any of his later first round picks, so he will trade his first, second and 4th round picks (4, 35 and 106), along with a 2020 third round pick to help balance out the TVC. This way, Gruden still will have 3 first round picks, which will go a long way in rebuilding the team, while getting Bosa, as the replacement for Mack. If he does go Haskins, he can trade Carr and get back that second round pick. Jets are an intriguing team. They may trade back, or get Allen or Williams, but I think their best course of action would be to get Jawaan Taylor, to protect Darnold. That means, with Murray, Bosa and Allen /Taylor chosen with the first 3 picks, the Niners could select Williams, Sweat, Oliver, Gary, Burns or Ferrell. They could trade back to 10, and still get one of those players. Niners have several options, and the Free Agency has given them a ton of flexibility. If the team picks Williams, it will be a scathing indictment on Thomas’ play (or lack thereof). It will also be a tacit admission of the gigantic mistake that Lynch and co. had in that first draft. Kittle saves that draft, otherwise it would be a real stinker. Given the gargantuan needs of the team and the multiple wasted opportunities in that draft, it really hurts. This is a make or break year for this crew. Maryland RB Ty Johnson has reportedly put up a 40 yard dash in the 4.3s, along with a 10’3 broad jump, at his pro day. For CFC: Vic Fangio said he didn’t think Devin White or Devin Bush are as good as Roquan Smith at this stage of their careers. I like White a lot but I would agree… he is not as good as Roquan Smith was last year. While saying that, I must confess I haven’t taken the time to fully study White so this is based on a small sample size. White has a lot of energy and flies around the field, and can make a lot of plays. But he wasn’t tasked with reading the game as much as Smith. Seemed to be given a lot of run blitzes from what I saw rather than read and react. But like you, I haven’t bothered with a deep dive as I figured he was never a real option for the 49ers. Pfft, White will have at least 30+ more tackles then Roquan had in his rookie season and easily 50 more then Bush. White will make Fangio eat those words. Gruden cried for 3 days after trading away Mack? Hmmmm…. I see your pro day was last week. How’d you do? Keelan Doss is a sure pro bowl prospect, who could help the Niners win a SB. But his Pro day has been moved to April 5th. Oliver’s pro day is Thurs 3/28, tommorow……He’d be a good trade down pick, but not sure if he’s really needed. His stock is rising, possible #4-8 pick. He has a quick explosive low first step. 6’2″ 285 may need another 10lb muscle, runs 4.8 or so, 32 reps, 36″ vert, 120″ broad, has great bend. Need to see his pro day 3 cone and ss numbers, I think he’ll be low b/c I’ve seen video of him working out these type of drills, he kills it. He does have short arms but Aaron Donald has 32.5″ arms and Oliver is Donald Jr.
Looks like Oliver killed it at his pro day. You were right, he did kill it. His numbers were 4.73-40 yd dash…4.19 sec. 20 yd shuttle…7.15 3-cone.. WOW. Those are numbers Linebackers and Safety’s have, even WR’s. Aaron Donald at the same weight mid 280’s, ran a 4.39 sec. 20 yd shuttle. Oliver’s 32 reps, 36″ vertical, 10ft broad jump, I mean this guy can play fullback which he did a few times on the goal line at Houston or LB, he’s just an athlete. But he plays violent! !..If he gets stronger, learns more moves and skills from pro coaches and stays healthy, he can be an All-Pro. Probably a 5-10 pick. Isabella as an option at z is different. He’s undersized, but he could well be an interesting option there. He and Metcalf are the two WRs I think will be guys that scare teams in the NFL. Maybe Butler too. If Ridley is sitting there in the 3rd round, Shanny could pounce. Goodwin/Pettis at x, Matthews/Ridley at z, and James/Matthews/Taylor in the slot. Big fan of Ridley. Much better player than his combine testing indicates. Minimal wasted movement, knows how to set up a DB, good hands. Good player. Would be a very nice 3rd round pick. My current hope is Bosa, Thornhill and Ridley in the first 3 rounds. Scooter, have you watched any video of Olabisi Johnson? Gary Jennings, 4.42 forty. Good possession receiver who can shield ball from DBs. Miles Boykin. 6′ 4″, 220 lbs, 4.42 speed. Good size, and coachable. Mecole Hardman, 4.33 speed. Did well against Alabama. Ashton Dulin, Malone U, 4.43 speed. Keelan Doss UCD. Caught 3 passes in the Senior Bowl, and had good practices. I like Allen. I just never liked him at #2 or before 3rd degree Burns. Sources are telling me that the Giants, and Chargers have both offered 2nd round picks for Rosen. The Cardinals want to move on from Rosen, but they want a 1st rounder. If the Cardinals pick Bosa, we are for sure trading down. If not, it’s Bosa for the win! Pats want him, and their first round pick is number 32, which is like a high second round pick, but is still a first round pick. Just hope the Cards do not help the Pats find their successor to Brady, so they win more rings. Razor you just became a journalist. Make up a source that tells you something inflammatory (or use a quote from your crazy cousin/uncle/aunt) and then “protect” the source. If the once wore a Jersey of the team it’s even better… you can say they are connected to the organization;). I think that I’ll reserve my ” I told you so….” until Allen gets taken by the Niners at #4, after the trade with Oakland…those extra choices could get us into the playoffs…by that time, Williams will have spent half his money, and Bosa will be in the aid station…. Speculating on who would pick which pass rusher, I would surmise the following players to various people. Q Williams- a JL pick. J Allen- a Grant pick. Sweat- a Paraag analytics pick. Ferrell- my trade back pick. I could live with any of those 7 picks. Bosa, Williams and Allen at #2 or Oliver, Gary, Sweat or Ferrell if we trade back. I don’t think that I’ve ever seen such a strong class of Dlinemen….And it doesn’t stop there.! A lot of teams are going to help themselves in this draft…. I agree. I want that trade back with Oakland, not because I like them, but that Gruden can give the Niners that second round pick, and the Niners can still get the player they covet. My bonus trade back would be with the Giants. Gruden gets Bosa, and the Giants leapfrog over TB to get Haskins, since there is talk about the Bucs wanting a QB that does not turn the ball over so much. At 6, the Niners are guaranteed at least one of those players, and more if 2 QBs are taken. I am going to call Oliver a Saleh pick. He would love to draft his speed and versatility. Jawaan Taylor could be a KS pick since he chose McGlinchey last season. – All that, plus some NFL rule changes, Jimmy watching tape with Mike. The production Pettis put up when he was targeted was nothing short of impressive. In 40 targets Pettis scored five touchdowns. 33 of those targets came with backup QBs. Scoring a touchdown once every eight targets is unheard of. Yet, a number one receiver cannot afford to injure his knee twice in a season. Glad he is productive, but he needs to be more durable. I am content. The Giants are offering a second round pick for a QB. I think they will give up a second round pick to the Niners to trade up and get the QB they covet. They do not want to give up a first round pick, and frankly, right now, Rosen is not worth a first round pick. Cards would do best if they kept him, and then before the trade deadline, trade him away to a QB needy team who is desperate because their starter went down due to injury. Gettleman is doing his due diligence, but he is also tipping his hand. Luckily, he has 12 picks to work with, so the Niners could garner a boatload of picks for their precious number 2 pick. Have you seen the movie Tombstone (1993, Kurt Russell, Val Kilmer, etc.)? The cast is rather strong and character development is decent as well. Many dimensions are explored–honor, loyalty, fear, deceit, loathing, commitment, regret, and more. Wondering which character you most identify with — Doc Holliday? Ike Clanton? Johnny Ringo? You might find Ike interesting–quite the tall talker until he’s faced down. Billy Zane as Mr. Fabian–wise and worldly, quite cute with words? Shootout at the OK Corrall was pretty realistic, although back then, they used black powder, so the smoke obscured their vision. If what happened in the movie was what happened in real life, it looked like they were shooting at point blank range. Hard to miss. Louis L’Amour thought Ringo was a tinhorn, and said he never saw the tombstones of any men he supposedly killed. I probably would associate myself with Doc Holliday, he did not give a damn. I like High Noon, 3:10 to Yuma, Stagecoach and Red River as classic westerns. None of the remakes. In Stagecoach, John Wayne plays the Ringo Kid, but is an outlaw turned hero. Give me the Magnificent Seven (original) and I won’t move off the couch! Good one. I even like the Japanese version. Yup, it was the Japanese movie (Seven Sameri) that inspired the American version. Great Kurosawa movie. Though Ran and Rashomon are better! Thanks for the heads-up – I’ll check them out. Rashomon shows how perspectives can be skewed, even while witnessing the same thing. Kinda like the draft prospects. For light entertainment, I would recommend Tampopo, about a soba stand. Something to watch with the grandkids- Totoro. Question for you all: Will Sheldon Day, Ronald Blair and Jullian Taylor all make the 53 man roster this year? I like all 3 players and think they are talented enough. Earl Mitchell and Cassius Marsh are gone and I think we will have Dee Ford and 1st Draft pick. Will we pickup another D-Lineman/Edge Rusher in the draft? Any trade scenarios to develop UDFAs? Going by Lynch’s comments, he thinks more D-Lineman the better? Earl Mitchell and Sheldon Day were healthy scratches at the back end of last season, when they were giving younger guys more playing time. I think that is a pretty accurate indicator of the team’s position on those guys – stop gaps until younger guys step up. Mitchell is already gone. I expect Day won’t make the 53 either. Blair and Taylor on the other hand got more playing time as the season went on. I think they will both stick for another year. Day was a waiver claim. Even a late round pick return for him would make sense. I expect good D-Lineman should have value anywhere. What do you think about Blair Scooter? I would think a long term contract for him makes sense based on this year’s play. He is pretty effective given the opportunity and should not break the bank in my opinion. He’s a handy player to have. If they can extend him a year or two on the cheap I would certainly consider it. But I suspect the team will want to see what they have in Thomas, Street, Taylor and whoever they draft under the new DL coach before doing so. Right…I forgot about Street and he is on his rookie contract. Street could force the Blair Witch Project to take a walk. Raj and his troll collage!! You are the troll old man!! Looks like Russel’s got a bustle in his trollhole. Rut roh! I’m looking forward to see what Kantevius Street does in TC. He might add his name to your list when the smoke clears. The only thing I know about him is what I’ve seen on his tape and that he is quite strong. Yes AES, should be a fascinating Training camp for the D-Line. I think if Street and Taylor or Day perform at the same level then Taylor or Day get the boot just because of a 4th round pick spent on K Street. Oh, good. That means the Giants need to move up to take Haskins, or they might lose him. Niner trade back position just got stronger. The Raiders take Allen. Q.W. or even QB Lock who was coached by Gruden at the Senior Bowl. I doubt the Raiders take Haskins or Cincy takes him at #5. The Giants can possibly move up for Haskins, doubt that too and take BPA, D. White, Oliver, Sweat or Lock if he’s there. Haskins probably slides or goes 5-10 maybe even to Denver or Denver moves up for Haskins or takes Lock if he’s available. I don’t think anybody moves up to #2 unless Murray is there. Giants had dangled OBJ to the Niners for the number 2 pick, then have tried to obtain Rosen. The Giants want a QB. That is the worst kept secret in town. Unless they trade up with the Niners, the Raiders may get the QB they covet, the Jets are also anxious to trade back, and TB was mocked with Haskins, lately. The Giants may miss out on both Lock and Haskins, unless they trade up, so the Niners are in a position of strength. Gettleman will look the fool if he tries to go cheap, then tries to use Eli for another year. His skills are fading faster than Peyton’s. Still, the trade back with the Raiders may be the best for the Niners, but they will not give it away like one mock advocates. They think the Niners will accept a 4th round pick and a 2020 second round pick, but the Raiders do not own a 2020 second round pick due to the Mack trade. Niners should receive the Raiders first, second and 4th round picks (4, 35, 106), and a 2020 third round pick. It would have to be the 20th pick in the third round to balance out on the TVC. Even if it was the top 2020 second round pick, the TVC would be skewed 138 points towards the Raiders, so their proposed compensation is a steal for the Raiders. If the Niners trade back with the Raiders, the Jets may not want to trade with their cross town rivals. The Jets would probably leap at the chance to get either Bosa, Q Williams or Oliver. Then, at 4, the Niners may trade back with the Giants, because TB may want Haskins. Also, teams like Denver, Cincy and Miami may want to trade up and poach Haskins. Moving up 2 spots to ensure getting Haskins may be too enticing for the Giants. They could save their other first, and their second round pick. The Giants could offer their first, third and 4th round picks (6, 95, 108), which almost add up exactly on the TVC. If they threw in both of their 7th round picks, it would add up exactly. Niners should be happy with pick numbers 95 and 108, because there will be good players around those numbers. The Niners, by trading back 4 spots, would end up with pick numbers 6, 35, 36, 67, 95, 104, 108, 176 and 212. Nine picks in all. With 3 QBs gone in the first 4 picks, the Niners may miss out on Q Williams and Ed Oliver, but may have Bosa, Allen, Sweat, Gary or Ferrell to choose from. They could trade back twice, and still get Bosa, the player Razor covets. With 5 good players to choose from, the Niners could trade back 4 spots, and let Denver select Jones. Denver could offer their first, third and 4th round picks (10, 71, 125), for pick number 6. With another QB taken, 2 out of those 5 remaining players will still be available. By moving back 8 spots, the Niners end up with pick numbers 10, 35, 36, 67, 71, 95, 104, 108, 125, 176 and 212. Eleven picks is all, which will help greatly in the rebuild. Sure am glad JL is following my advice, and advertising ahead of time, the Niner willingness to trade back. Some teams will covet a player just out of reach, and want to trade up to get the player they really want and need. John Lynch is NOT following your advice. Sorry. He’s doing what he’s doing without you. At this moment you could be a mollusk in the Indian Ocean and he’d still be doing what he’s doing. Please don’t start with the ‘Lynch reads my posts and is acting on my counsel’ rant. It’s been a tired act for two years now. I advocated that the Niners should advertise the fact that they were willing to trade back, in 2017. Thankfully, JL took my advice and traded back with the Bears. I was extremely happy that they also obtained 2018 second and third round picks. It was as if they read my 10 point plan, and followed it closely. The only 2 things JL did not do, was avoid the red flagged players, and avoid making the unforced errors. I have a secret weapon. Joan in Accounting clips out my posts and passes along my ideas, when she think they may help. Maybe your beef is with her. You’re confusing ‘approving of what Lynch is doing’ with ‘Lynch not acting stupid because he consumes your advice’. That’s akin you taking personal credit for people stopping at stop lights while you’re out driving. I presume you still have your license. I think most 9er admin staff are a bit more sophisticated than you give them credit for–printing hardcopies of Grant’s blog and using scissors to cut out your comments? Sure…. Hoping we don’t have to post the clinical description of narcissism…again. A few more mocks from you and we’ll be at the five hundred twenty-five thousand six hundred threshold. I did mock once a day once JL did say he would consider them, so I probably did 60 during the two months before the draft. Last season, before the 2018 draft, having number 9 was not going to garner much draft capital, so I did not propose many. So far this off season, I have done 10 since January. Typical Baalke stench. Going emo and unhinged. SF’s #2(2,600) will cost the Raiders #4,24,106(2,622)…almost exact TVC. Nothing less!! That is why I do not think Gruden would pull the trigger on that deal. He wants to keep 3 first round picks. 4, 35, 106, plus a 2020 third round pick would balance out exactly if the Raiders picked 20th next season. That is reasonable and practical, and would be a win/win for both sides. Niners could even trade back from the 35th pick, to garner even more picks. Additionally, the Bears will give the Raiders their 2020 third round pick, so the Raiders have 2 possible picks to trade away, giving them more flexibility. * Have given due to the Mack trade. You are the funniest narcissist Seb. And nobody will deal w/SF if Murray isn’t there. Haskins goes 3-10. Murray could also suprise everybody and drop to 5. Couple months ago Murray was considered a 1st to 2nd rd QB being 5’9″ then, small also possibly going to baseball. Once he said football only and measured 5’10 not 5’9, he all of a sudden went to #1…So, some teams might not be so high on him going 1 but top 10. JL disagrees with your assessment, and thinks there might be several teams wanting to move up to the number 2 spot in the draft. JL also shrewdly mentioned that he would only accept fair deals, so Gettleman better pony up some of his 12 picks, or risk losing out on the QB they covet. So I am a narcissist when I say something, and it becomes a reality? I mentioned 10 things JL should do before the draft, and he does 8 of them, and you think that is narcissistic? JL did not do 2 of them, so I was wrong twice. I am not perfect, but you seem to deny me any credit for nailing that draft strategy, which says more about you than me. Nobody will deal with the Niners? They did deal with the Niners in 2017. In fact, the Niners traded back, garnered a boatload of picks, and still got the player they coveted.That was another draft strategy that I predicted, although not with the Bears. Actually, JL mentioned before the draft that the Niners will consider every mock. That is why I flooded this site with many mocks with many scenarios. Sure, he is free to ignore my advice, and could come to the same answer without my input, but when I advocate something ahead of time, then see him do it, I get to crow. Before the 2017 draft, I called out clearly and loudly, the Niners need to advertise the fact that they are willing to make a trade back. This was done to make various possible options proposed, and presented so others can see them. Advertising ahead of time would help facilitate the deal, and the Niners did trade back, so I got to crow. They also traded up. Rocket derided my mocks, saying that the Niners would never trade back. No wonder he left. Sure, the draft is an inexact science, but having a smart strategy would help the process. I will post my 10 point plan soon, so new posters can see what the Niners could do. I will also be posting various mocks involving possible trade up teams, so JL can see more possibilities. He should pay careful attention to the compensation, because I am trying to keep the deals balanced, so they are good deals for both sides. Win/Win situations. However, I will add another strategy. The Niners should trade with struggling teams, so both teams will benefit. They should not be making deals with playoff teams that help them win Super Bowls (Trent Brown). With all of the resources and money they have to use, with the relationships they have all over college and the NFL-not to mention their superior experience relative to yours-what makes you think they listen to anything you have to say-or anyone else on this blog?? And the answer is, you don’t! You just like to stir it up by saying provocative things and watch which “moths come to the flame”-for a chuckle. Like the way you used to play with Prime……………..
You ain’t foolin anybody, Sebs! With all the money and resources the Niners have, along with all the experience relative to me, they still picked red flagged players and made unforced errors. I certainly would not have picked Foster or Joe Williams, and I would have saved draft picks, and selected both CJB and Pettis later. I am just taking JL at his word. He is the one who said he would consider every mock. That is the smart thing to do. He is considering all possibilities, and is doing his due diligence. Maybe your beef is with JL for saying that. You should rip him for being so truthful, and expect him to lie and leak like Baalke did. I do not need to fool anyone. You seem to fool yourself without my help. Houston defensive tackle Ed Oliver is an absurdly good athlete, in the same way grass is absurdly green and water is absurdly moist. At Houston, the defensive tackle was a generational sort of talent, and he’s likely going to be great in the NFL, too. Size-wise, Oliver is basically Aaron Donald. In the 40-yard dash, Oliver is basically Arian Foster. In the bench press, Oliver is basically Ndamukong Suh. In the shuttle run, Oliver is basically Le’Veon Bell. In the three-cone drill, Oliver is basically Jason Pierre-Paul. In the vertical jump, Oliver is basically Von Miller. I would hate to pull another Solomon Thomas….In our haste to fall in love with players the in crowd have touted (NFL Experts) like Bosa, Allen and Williams, is it possible the best player with the best stats has been overlooked because he’s a dark horse??? I hope the Niners trade back, and still get Ed Oliver, but he may supplant Bosa as the best defensive player in the draft. Oliver measured out so dominantly, the Niners might want to stay at 2 and take him. I like Oliver a lot but not at #2. Best case scenario for me is a trade down that garners two first rd picks with possibly Oliver on the table. How about Oliver and Burns in the first rd with a trade down? Trading down could give us a lot of options. I haven’t heard much talk about Christian Wilkins, but he was kill’n it in the National Championship game. He owned Alabama’ Olinemen in that game. If Wilkins last to the second rd, he’s going to be a steal. Robert Quinn to the Cowboys for a 6th round pick? Before anyone says why didn’t Lynch try and get him…. you reap what you sow Jed York. Bottom line, he didn’t want to come here. Even as a PR move why not bring in a Mike Holmgren? Quinn is a has been, and his age/weight combo– 257 Lbs– leaves a lot to be desired. The 49ers, on the other hand, have a shot at elite pass rushers, Ed Oliver (above), allen, Bosa or Williams!! !….Even Jaylon Ferguson is better with the 2nd most sacks in the NCAA last season. You reap what you sow, Jesus Jim Harbaugh is gon, let him be gone that saying is played out. 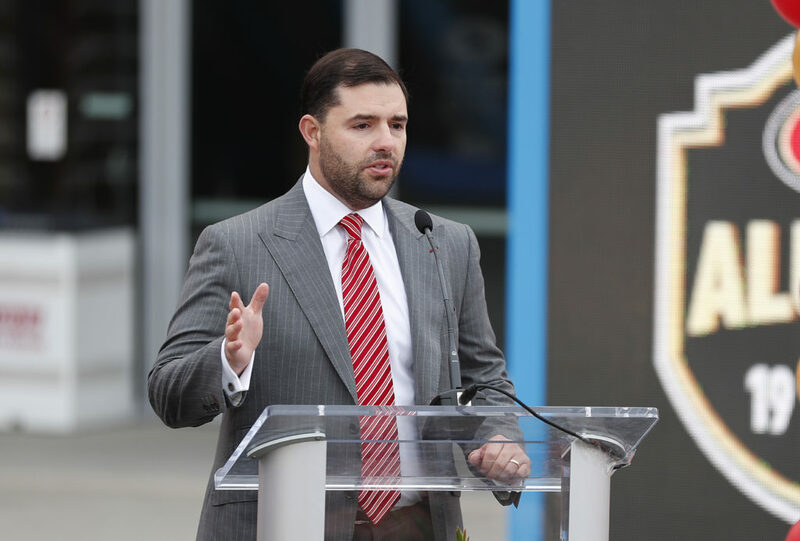 Jed York had nothing to do with Robert Quinn. and Robert Quinn is no longer box office. Next!!! Even at 8 1/2 sacks last year, that was better than any defensive end we have had in years… and at age 28 he could of been a very good contributor to this defense. … as far as played sayings… weren’t you in the group who constantly said “in Baalke we trust”. I would simply like that damn front office and “owner” to quit with the stupid decision making. ….one last thing, then I’ll drop it. York is directly responsible for the losing culture that stinks up the place, his handling of Harbaugh directly set back this organization’s ability to pull in talent on multiple angles, free agents, coaches, and top office personnel alike. Actually, I blame Baalke more for the JH debacle. Thankfully, he is gone, and JL is changing the culture. I am extremely pleased that JL has attracted good free agents, unlike Baalke who had decent FAs avoid the Niners like the plague. While I have eviscerated Jed for all his past mistakes, at least he is trying to improve, and I am glad he is letting JL and KS have time to rebuild the team. Jed is learning from his mistakes, and seems to avoid repeating them. However, next time, I hope he figures out where the studs are, before punching a wall. It didn’t start with little York, tho he’s certainly carried on the York tradition of out-of-this-world arrogance and ineptitude. Old man York laid the foundation for all of our losing. Argued and fought with people who have forgotten more about football than he will ever know……. Saw, will wonders never cease. We do agree about Dr York. However, I will disagree about worse ownership. Haslam is corrupt. Irsay is a druggie, and Snyder is a slimeball. Jerruh is bad, but at least his son has a lick of common sense. question now is, is his pro day metrics good enough to move him past Alan, Williams or Bosa? * Will his televised blow-out with third-year head coach Major Applewhite (fired after the season), affect his draft? * What D-Line position will the team that drafts him have him play? * The big question is, how much Grant says he weighs, or you could get NostradamnSEB-us to pontificate? Geep, currently Ed Oliver is at 292 Lbs. I’m torn between Williams and Oliver. I just want a decent fish taco…. Combine and pro day numbers indicates he fluctuates between 287 and 292 lbs. However, on his weaknesses in the profile, the scouts say he plays under 280 lbs. I do not think he will be playing at NT, but every other position along the line. It would be interesting to see him used as a short yardage RB. Maybe even have him play the FB position. He would bludgeon defenders down field. He weighs 21 lbs more than Bosa and ran faster. His game film shows twitchiness and explosiveness. Oliver made a lot of money today. Here is Olivers Pro Day highlights 1:24 long. A big strong guy in his 280 lb’s, very quick, low bend, twitchy and ran a 4.73 sec 40. Will insane pro day keep Ed Oliver out of Packers’ reach? There may not be a better potential option for the Green Bay Packers in the 2019 NFL draft than Houston defensive lineman Ed Oliver falling to the 12th overall pick. But it’s becoming harder and harder to envision Oliver falling all the way to No. 12, especially after he produced an insane pro day at Houston Thursday. If you are going to deny me the Bosa Constrictor, give me 3rd Degree Burns. That is all. Keep in mind Razor, this is a 292 Lb Man. At the Combine Oliver was 6’1 7/8 and 287lbs.. at the Pro-day 3/28, Oliver was 281lb. So basically mid 280’s, like A. Donald but Donald was 6′ 3/4″ 285 lb, ran a 4.68-40 to Olivers 4.73. Donald had a 32″ vert to Olivers 36″ and Donald’s 116″ br. to Olivers 120″ br. A year or two ago they had Oliver at 6’2 then it went to 6’3″, 280lb to 292lb. They inflate college wgt/hgt as usual. Maybe more important was Olivers 20 yard shuttle 4.19 to Donald’s 4.39 sec. Their 3 cone was the same. They both have short arms. Q. Williams has longer arms than those two but plays different. They both are powerful, explosive and play violent with a super quick explosive first step. If Oliver has a higher ceiling, learns more moves and listens, he’ll be great for some team. He did have an argument w/his coach on live TV but he’s driven and it wasn’t anything. He does a lot for his community and is a clean act, ect. Just not sure SF would need another DL but who doesn’t want Donald Jr.
Trading a second-round pick to the Chiefs for premier edge-rusher Dee Ford might change the 49ers’ board a bit, and the momentum may be shifting in the building to a defensive tackle in Williams who can play the run and pass equally well, is remarkably consistent snap to snap. While Williams doesn’t stand up to power as well as one might like, he’d be a perfect fit in Robert Saleh’s defense. – Will draft a DL round 1 (true story). – Will draft a WR by the end of day 2. – Will probably draft a CB at some point. – Will probably draft an off-ball LB day 3. – Will probably add another RB either late in the draft or as an UDFA. Interestingly the 49ers don’t seem to be spending much time with safety prospects or OL prospects. It’s NFL lying season! Believe half of what you see and nothing that you hear! If we draft Ed Oliver or Q Williams we will have Armstead, Thomas, Taylor, Street, and the new pick all drafted to play a similar role. Of all of these Players I think Only Armstead and Q are really capable of playing Buckners role should he go down or to give him a Breather (maybe Oliver). And Williams is the only player capable of manning the nose from time to time. I like Oliver a lot and believe he might be the more productive pass rusher of the 2 I’m just not sure how he fits in this roster if they are not giving up on Thomas and Letting Armstead go. Chris Simms breakdown of the Edge Rushers. I’ve been listening to a lot of Chris Simms lately. I like his breakdowns. His interview with Shanny was a good listen. Bosa, Gary, Allen, Sweat, Burns, Ferguson and Ferrell were his top 7, and thinks they may all go in the first half of the first round. Ferrell had a terrible Pro-Day…and he had a bad combine pulling out, some teams didn’t buy the injury. Now he ran a 4.85 sec 40 at his Pro-Day and everybody went silent a report said. PLUS he pulled out lame again. His stock is dropping and he could go in the 2nd round now. Ferguson is also a day 2 pick. Injuries will do that to a prospect. The scouts will look at his game tape, and see a very talented player, who did well in the National Championship game. Raiders and Gruden will not flinch over Ferguson’s high school arrest. Gruden may select a QB first, then get a pass rusher like Ferguson with a later first round pick. Then possibly a TE or RB, since he got AB and Tyrell Williams. Thanks for posting this Shoup. The segment on the TEs was interesting too. I like that Simms takes the time to explain some of the concepts. His example of “speed to power” for edge rushers was really clear. Jordon Howard traded to the Eagles for a 6th round pick. Considerably reduces the chances that any team might trade for Jet or Breida. With the Niners second pick – G or Edge. The Niners sign Ziggy after his medical checkup in mid April. 4th round might be a stretch, and will probably need to trade up into the bottom of round 3 to get him. I also like Justin Layne, Lonnie Johnson, and Isaiah Johnson in the later rounds. Sean Bunting is ranked 138. Lonnie Johnson is ranked 156. Isaiah Johnson is ranked 229. Had brutal incident w/ checkout person at local @cvspharmacy. Wrote to them. They gave me $7 coupon. I wrote & said $7 didn’t address the matter. Never heard back. Is @cvspharmacy generally this rude to paying customers? Glad the Niners are calling for trade back proposals. Sims said the Jets are doing the same thing. Kyler Murray threw a wrench in this whole draft, which seems to benefit the Niners. Jets want Allen Wrench because they got jolted by Barr. They may trade back with the Giants, if the Niners trade back with Oakland. Jets may still get Allen at 6. If 3 QBs go early, and Q Williams and Ed Oliver go next, Bosa and Allen may still be available.